The history of The Rose and Goat Retreat. 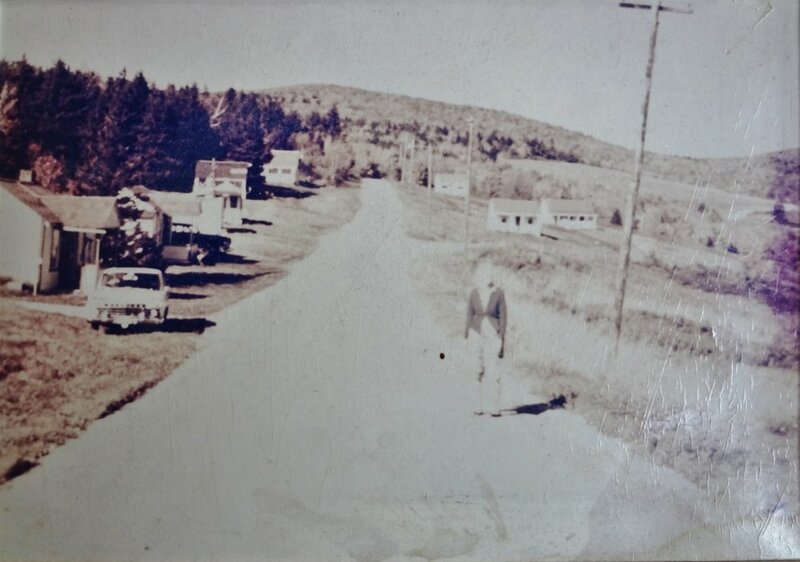 This is my grandmother walking up Moore's Road with the original seven cabins behind her. Hilltop cabin is on her left and Lingerhere is behind her on the right, while Comsomore is just behind Lingerhere. Our family used to spend summers here in Comsomore cabin in the 1960's and early 1970's until Marjorie Moore sold the whole 50 acre property to my father in 1976. His dream was to establish a retreat for people to come to find holistic and spiritual peace - where healthful foods were offered to guests and with a meeting house on the propery for educational seminars and gatherings. While the meeting house has not transpired yet, three of the original cabins have been replaced and the main lodge is now in the vicinity of the original general store, where Ms. Moore used to greet her guests and have blueberries that she picked right here for sale by the pint, as well as hand made aprons and pot holders. The original outhouse still stands, as a tribute to the many years of guests who made this their summer home since the 1920's.